Magic manifests itself as it can; as we wish; as we are able to see it. Oh sure, we'd like to think that it's all rainbows from the palm and levitation, tossing monsters in the abyss and summoning dragons on command. At least that's what the movies might like us to believe. But magic weaves itself into every day of our lives, which is why we can sense it, paradoxically, just beyond our senses. And reading is perhaps the best way to engage that magic, as it too, works, just beyond our senses. It is the best magic we can find on a shelf. If you're looking for magic on a shelf, you'd do well to Andrea Hairston's 'Redwood and Wildfire' (Aqueduct Press ; February 28, 2011 ; $20), an engrossing, hilarious, surreal history of magic as it is often practiced in the United States of America; that is, in those moments when we try to make movies, music, poetry, stories — entertainment. And just to keep everything self-referential, here's a book about entertainment that is more entertaining than most of the sorts of entertainment it describes. Hairston's novel is set at the turn of the 20th century, as technology and art transform society, and the lives of Redwood Phipps, a black hoodoo woman, and Aidan Wildfire, an Irish-Seminole man. It's a simple journey; from Peach Grove, Georgia, in 1898 to Chicago in 1913. A mere fifteen years in which a nation and the characters are reborn, rising from rural swamplands to cities that exist in their present but clearly augur the future. It's also a simple love story; Aidan and Redwood meet in the opening passages, and a difficult relationship plays out over an era of epic change. Between the two characters and between the beginning and end of the novel, readers experience life, as imagination writ large. Hairston is writing about magic, in all its forms, and she is able to conjure it with breathtaking prose, that is — and here's the real magic — excitingly readable. 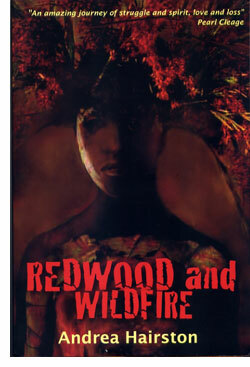 'Redwood and Wildfire' is funny, surreal, and written in a very smart vernacular that trips off the page and infects the reading experience with the sort of visions that are usually accorded only to shamans. Like the best conjurers, she's something of a shape-shifter, so expect to find more than just prose; her characters are writers and artists, so there are embedded poems, songs, stories, even a screenplay, of sorts. Of course, the whole novel plays out like a movie in your mind, but it's much better than any you'll find in a real theater. Hairston's novel is populated by characters who do not leave your side after you've closed the book, but instead remain right there, in your life, and in your mind. If they talk to haints and spirits and things most of us are not fortunate enough to see, then at least you get to do so as well. She wrangles a huge cast, befitting of the epic nature of the novel, and keeps everyone crystal clear in the process. And while the novel is essentially a journey, Hairston manages to create some unforgettable set-pieces. 'Redwood and Wildfire' is a novel about love and magic that bridges any gap one might suspect exists between the two of them. 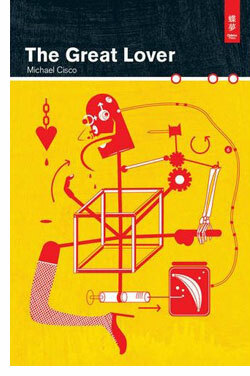 Michael Cisco lives in his own universe — of words. "You can hear my words," he tells us in the prologue to 'The Great Lover' (Chomu Press ; April 14, 2011; $17.50 / £13.00 / €14.50 ; 446 pages), "but you cannot hear the wild gaiety with which I peak them." He's wrong there. It is not a book of rocket science, and for that we can be thankful. The title pretty much gives away the game; 'Robopocalypse' is a clearly going to be a novel in which robots wage war against humanity. This is the worst-case scenario for the Singularity. There are no happy mutants here. On the first page, the war has ended, and we meet Cormac "Brightboy" Wallace as he is attacked by a swarm of explosive robotic beetles. Readers might well think it's not going to be pretty. It's not, but 'Robopocalypse' is as gripping as you could hope it to be and filled with imaginative scenes of robot-versus-human mayhem. The real shock is how affecting this novel is. For all the fantastic and detailed imaginations of technology gone wild that frame the story, 'Robopocalypse' has, at its heart, many hearts, most of them human, all them laid bare in precise, fine prose that gives the novel an emotional wallop. The machines may have decided that we need to be (mostly) eliminated, but we made these machines. They are bringing about an end to civilization as we know it, and they are no less than mirrors of their makers. Because it deals with the end of the world, 'Robopocalypse' has a global focus, which sounds a bit like an oxymoron; how can you focus on everything? Well you can't, but in order to get the right scope, Wilson carefully builds a huge cast of characters in short chapters. This is a pretty big challenge that he easily manages. From American grunts in Afghanistan (yes, we still have men there in his not-so-near future) to an elderly Japanese bachelor living with a humanoid companion robot, to a British phone phreak, to the Osage nation, Wilson picks and chooses well. The characters who tell this story are our anchors; we want them to survive, even if not all of them are (entirely) human. The plot here, while quite straightforward, is certainly well handled. For all the great technological insight he brings to the novel — Wilson is a roboticist, so he knows his stuff — what we have here is a horror novel, and in that sense, it's extremely creepy and effectively terrorizing. Framed by a nice before-and-after device, the action begins when a powerful AI escapes into our networked world. In the months that follow, there are many hints that things are going awry, and these early scenes are easily as effective as the bigger scale set pieces that follow. The big-scale scenes, as well as the smaller ones, are written in the same fine prose that makes Wilson's characters so involving. Wilson has a great sense of setting up his characters and location, then just lets things rip long enough to give us a sense of how bad it can be. He doesn't go into too much technical detail. He keeps his focus on the emotional experience of the humans. Wilson's storytelling style is pretty complicated. Each chapter has opening quotes, sometimes from characters you've not yet met, and they close out with hints of what is to come, often explaining why what you've just read is important. It's the kind of stylistic turn that could easily backfire, but Wilson is so terse and focused on his characters, that these pointers — part of an attempt by both humanity and its robotic foes to put together a picture of what happened — work well. They enable Wilson to keep his eyes on the twin prizes of this book; great characters and non-stop, well-written, imaginative scenes of robotic mayhem. Part of the reason that this works as well as it does is that Wilson has clearly built up a huge underworld of robotic development, both before and after the "Precursor virus" takes hold. He could probably write a non-fiction book about the science behind this one. Fortunately, he resists the temptation to include any of that book in Robopocalypse.' For all the obvious work the author did in creating a technological back story and backdrop, we hear very little about the technology. Instead, we see the end result from the human perspective, and we get that vision, entirely. 'Robopocalypse' bucks the current trend of happy or incomprehensible singularities in science fiction. It's very old school in this regard, which might be a problem if Wilson were less technically savvy or less focused on his characters. This is the robot uprising we all worried about. In some ways, it's what we expected, but Wilson is smart enough to surprise us with his imagination and engage us with his characters. 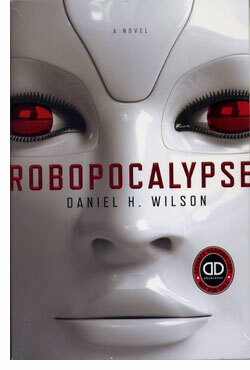 'Robopocalypse' is all good parts with good characters, most of whom are mostly human. You'll look twice at any programmable appliance you have after you finish reading this novel, and wonder if what you are looking at might instead be a mirror.